Finally after days of torture my app is in iTunes store: HexGuess v1.0. 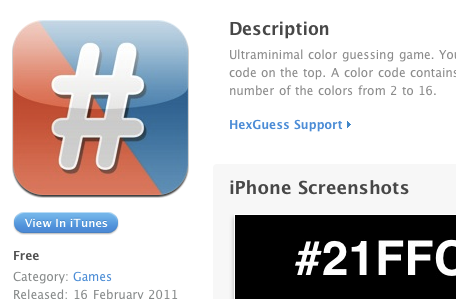 It's a color guessing game by the color's hexadecimal code. Very basic and simple. Soon I'll make a blogpost about what I've learnt during the development and some source code. Download the app if you like, it's free. I have read this blog and got the good information from this blog that is about HexGuess iPhone app which is really nice app so thanks for sharing this information.